Wellington, FL – May 11, 2017 – Roberto Daza of Wellington, FL, and his own Biscayo took top honors in the $10,000 TackNRider Open Stake at ESP Spring IV, finishing the jump-off track in 41.49 seconds. Paulo Santana Filho and SL Iplacavel, owned by Santana Stables, LLC, crossed the timers in 43.996 seconds for second place, while German Camargo of Loxahatchee, FL, and his own Centurio captured third place with a jump-off time of 40.97 seconds, adding four faults to their score. Twenty entries contested the class, which was held in the Van Kampen Covered Arena at Equestrian Village, while six combinations moved forward to the jump-off. Only Daza and Santana Filho finished the day with a double clear effort around both tracks. Roberto Daza and Biscayo in their presentation ceremony. Mia Albelo of Coconut Grove, FL, and Cassandra Dreams finished atop the $1,500 NAL Child/Adult Jumper Classic after completing the class as only pair to go double clear in both the first round and the jump-off. Ansley Wright of Manalapan, FL, and her own Coriano van het Hermitage finished in second place with four faults in the jump-off round and a time of 38.856 seconds. Ava Hoffman of North Palm Beach, FL, and Kalle, owned by Siboney Ranch, rounded out the top three after finishing with a time of 54.756 seconds and eleven faults. The $2,500 Low Junior/Amateur Owner Jumper Classic saw Ty Simpson of Wellington, FL, and Indiana 127, owned by Hollow Creek Farm, take top honors in the class after completing the jump-off track in 42.955 seconds. Erika Jakobson of Boca Raton, FL, and Up to Date Dodville, owned by Barn Rat LLC, rode to second place with a time of 45.94 seconds, while also taking third place aboard Van Gogh, owned by Barn Rat LLC. 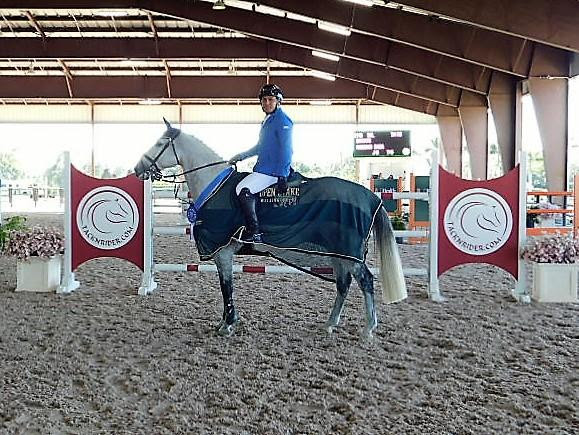 Mia Albelo of Coconut Grove, FL, and Cassandra Dreams also took first place in the $1,500 M&S Child Adult Classic after completing the short course in 40.167 seconds ahead of Avery-Anna Hogan of Wellington, FL, and her own Eurocommerce Tampa, who stopped the timers in 41.759 seconds. Zayna Rizvi of Greenwich, CT, and Forget Me Knot, owned by Peacock Ridge, LLC, took third place with a time of 44.259 seconds. Lindsey Tomeu of Wellington, FL, and Statement, owned by Popish Farms, LLC, rode to the top of the Adult Amateur Hunter Division, finishing the weekend as the divisional champion for their performances, while Margot Hirsch of Palm Beach Gardens, FL, and her own Lookalike earned reserve champion. Zayna Rizvi of Greenwich, CT, and Verdana, owned by Laura Wasserman, were victorious in the #1 Education Place Junior Hunter 3’3″/3’6″ Division, taking champion awards. Emmanuelle Greenberg of Boca Raton, FL, and Czech Mate, owned by Pumpkin’s Patch Farm, LLC, were presented with reserve champion accolades. Isabella Longo of Plantation, FL, and her own Into the Grey finished as division champions in the UHealth Children’s Hunter Division ahead of Isabel Beltran of Jupiter, FL, and her own Alleala, who took reserve champion after their weekend of strong performances. The Green Hunter 3’3″ & 3′ Division saw Isaac Leffkowitz of Ocala, FL, and Pianist, owned by Kat Chrysostom, earn the weekend’s top title in the division, while Brady Mitchell of Wellington, FL, and Kind of Blue, owned by Skyline Stables LLC, captured reserve champion for the division. The Small Pony Hunter Division was championed by Lauren Gee of Valdosta, GA, who piloted Grand Slam, owned by Sweet Oak Farm, to the champion title. Elliana Schulties of Jupiter, FL, and Picturesque Debut, owned by Schulties Property Group, were presented with reserve champion honors. The Low Children’s Hunter Division saw Caelan Brindise of Jupiter, FL, and her own Humble and Kind take show champion honors, while Sophia Ibanez of Issaquah, WA, and Casino, owned by Woodland Way, Inc., finished in reserve. Competition during ESP Spring Series continues with ESP Spring V, beginning Friday, May 12 and concluding Sunday, May 14. For more information about PBIEC, please visit www.pbiec.com.